We help businesses to create efficient procurement organisations. Elevate your procurement performance to a new level. We are specialized in procurement performance management, procurement and purchasing function out- and in-sourcing. We do not represent and sell big brand e-procurement suites because we are convinced that cost-efficient and simple tools will have a much higher adoption and success rate within your procurement teams and community. Quick deployment of simple tools and solutions, at the fraction of cost of large management consultants, unique predictive algorithms to show expected future performance. Ocure Analytics manages your transition of any of your procurement functions to BPO's or your captive service center. With multi-year experience in professional transition management we ensure that the transfer and stability times are shortened and the change is seamless. We fine-tune your organisation and coach your category heads to achieve optimal performance. Utilize the knowledge of 30 years of procurement executive experience. We are at your convenience to assess your current procurement operation and guide your organisation towards excellence. Pypette is a unique SaaS application that helps procurement professionals and CPO’s answer the questions that a few other e-procurement system can: what your savings projection is and where the gaps are in performance. We believe that it is imperative for the success of procurement to improve our decision paradigm to effectively supplement our experience. Gut-feeling is great, but we need to come up with something way better when deciding about efforts impacting multi-millions. We want reports to become a feature-rich part of the daily sourcing work, that actually add value for all instead of consuming valuable time. Out of a minimum set of basic data – i.e. Savings, End date, Owner, etc. 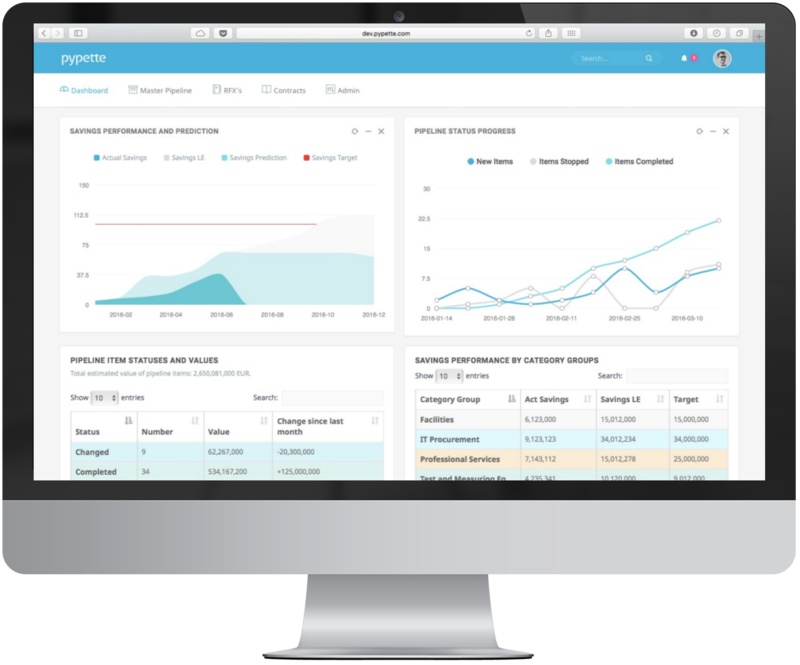 Pypette creates more than 20 different types of real-time analytics that are way beyond usual reports. They truly reveal the truth about how Procurement works. They can make a difference. It’s time to enhance your decision making principles. Look behind your data. Discover correlations that reveal the inner dynamics that move your team. Predict precisely what your team will be working on in 1-3-6-9-12 months’ time. Concentrate your resources on projects that make an impact – and ditch those only fragmenting your efforts. Start having a real-time dashboard and a true deep-dive – at every login. Do you REALLY need a pipeline tool? 13 Nov 2017 Do you REALLY need a pipeline tool? 13 Dec 2016 Decentralization of Procurement is the next trend? Ocure Analytics is a boutique consultancy that brings you 30+ years Procurement Executive experience and hands-on knowledge to enable your existing procurement organisation to perform on unprecedented levels– or create a Procurement function for you that delivers tangible improvements to your bottom-line results. We deliver inexpensive, quick to deploy solutions that reveal the maximum details of your operation with minimal inputs and integration to other systems. Ocure Analytics Inc is registered in the EU. We believe in and live by our core values which are integrity, trust, drive and excellence. Integrity: security of our client data is of the essence for us. Everything you trust us with is safe with us. Our clients’ trust is our bread and butter – our integrity is our most valuable asset to preserve. Trust: Procurement is all about trust. The business trusts Procurement that it can do a better job at dealing with its 3rd Party Suppliers than they could. It enables business functions to focus on their core competency and in consequence, drives results. Without trust, there’s no procurement. Trust is the frame in which we operate. Drive: We drive for results. We drive for change. We drive Procurement function for the better. We help your procurement colleagues to find new drive through our stellar and skeletonized reporting function and the maximum value available from the minimum set of data we ask for. Excellence: There’s certainly room for mediocracy. But if you are in a business that wants to become world-class, you cannot afford the luxury of not working with the best. Excellence is our DNA. We don’t go public with anything less than perfect. Our bar is high, but it enables us to match your bar. It also enables us to stand out. It enables you to excel through our services.